SLUB (the new kernel memory allocator delivered with Gutsy Gibbon) exposes a bug in fglrx that manifests itself as a failure over suspend/resume. Note: This bug is sufficiently confirmed, please do not add new statements confirming it to the bug report. Although it seems nothing gets recorded that I suspended my machine in the dmesg. Thanks for taking the time to report this bug. Unfortunately we can't fix it, because your description doesn't yet have enough information. 2. Please run the command "dmesg > dmesg.log" and attach the resulting file "dmesg.log" to this bug report. 3. Please run the command "lspci -vvnn > lspci-vvnn.log" and attach the resulting file "lspci-vvnn.log" to this bug report. After further testing I narrowed it down to the fglrx module, but even using the latest drivers (8.38.6) it gives me problems under 2.6.22 but works flawlessly under 2.6.20. It might be, but I can't get it to suspend, let alone resume afterwards. I am having the same problem on a IBM T41 after updating to gutsy. Suspend-to-RAM worked fine in feisty, but after upgrading to gutsy tribe 4 suspend-to-RAM stopped working; the computer will not even suspend, it will stay in a semi-awake state (processor, fan etc. running, but screen is black). No response from pressing any keys (not even the Magic SysRq is responsive). This happens no matter if I use the fglrx or the open source radeon driver. Hardware configuration (lshw) is attached. What other information should I provide? I have the same problem with the Gutsy suspend scripts, but I noticed that a simple echo mem >/sys/power/state works fine. After the latest updates to the acpi, suspend-to-ram has started working for ma again on my IBM T42 (sorry, T41 in my last post was a typo). 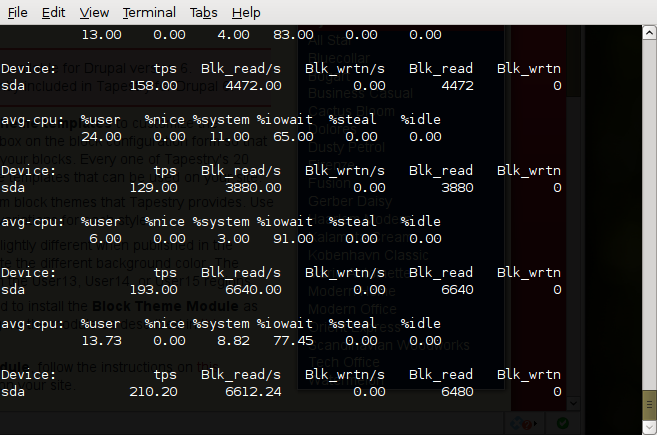 the command results, metaphorically speaking, in a screen or better screenshot. The screen remains visible but the machine is lock down without the possibility of input or interaction. I've to perform a hard power off. Suspend to RAM works again, but with quirks! After resuming from suspend Gnome Power Manager shows a tooltip which says there where problems. What makes me wonder - in messages I have lots of audit error messages with missing access rights. I cut most of them out cause I do not want to show all my databases here in public. As I also own a Z61m but use Gentoo on it... I just tried an upgrade to 2.6.22, and I noticed just like  that the new SLUB allocator breaks fglrx. Reverting to SLAB fixes the problem for me and I can suspend/resume just fine. Ubuntu sets CONFIG_SLUB=y in its generic 2.6.22 kernel. If this would be reverted to CONFIG_SLAB=y (instead of using still "experimental" code, although the problem probably lies in fglrx) suspend/resume should work again. But nothing works. The machine goes into sleep but the half-moon does not stop blinking. So I've to switch the power off hardly. I think we could assign this bug to Ubuntu Kernel Team and in consideration of numbers of people who has written a report we can change the status to confirmed. Yeah, SLUB is the issue, I compiled a kernel with SLAB and it suspends and resumes without a hitch. also tried it on a custom Gutsy kernel 22-11-generic from git yesterday, only changing SLUB to SLAB in the config. Suspends / Resumes fine, but its too much hazzle, as none of the restricted modules will work of course. Will this be reverted in gutsy, or will fglrx need to be fixed instead? I talked with BenC on yesterday's kernel meeting and he told me that he will try to contact ATI about that. It is obviously fglrx's fault and there is only a minimal chance that the allocator is reverted back to SLAB for Gutsy. Setting importance to wishlist, since we are dependant on a fix from ATI for this. I don't think that this has to do with ATI - I have a Z61m with INTEL Dual Core with INTEL graphics card. That means these problems are on NON ATI machines. after resuming from suspend to RAM, there is the desktop again. But after about 30 seconds, machine suspends to disk which is very annoying. If you leave it as a wish item - shall I open another bug report? i am almost sure you are seeing something not related to this bug at all. This bug's symptom is that you cannot even complete the suspending of the computer, e.g. the machine won't even enter sleep mode at all. Plus, my machine supends and resumes fine if i stop X and unload the fglrx module. Ubuntu may want to consider this a show stopper for releasing gutsy, or at least flag all over the place this problem. Reason I say that is if 5% of all of your potential upgraders are laptops running ati graphics (just shooting in the dark re percentage, but if anything I assume the actual number is higher than 5%) then 5% of all Ubuntu users will feel badly burned by the upgrade to gutsy. A broken suspend, when suspend worked fine in Edgy, is a critical bug. BTW, I'm running ati's latest stable release of fglrx and this suspend problem shows up in it as well. I switched to ati's fglrx from ubuntu's in the hope that the ati/glx slowdown would be fixed (wasn't, had to disable glx server). I too suffer from this problem, and for now have chosen to run fglrx driver without the kernel driver (kinda defeats the point, but it plays better with the console fonts than the vesa driver). From Ubuntu's side, is it reasonable to revert to SLAB? Is anyone in ati saying that 8.42 or so might address the SLUB behavior? I really would aprecciate, if there could be any information, what ATI will do about this...and when? what did they answered you about your questions? I can confirm the same behavior on my z61m (Intel Core 2 Duo/ATI X1400/latest Gutsy fglrx driver/2.6.22-12 kernel/fresh install of tribe 5 + updates, otherwise stock): initiating suspend results in a black screen, a blinking cursor in the corner and a blinking half moon LED. This happens during entry into suspend - it starts suspending and never completes. A hard reset with the power button is all that will bring the system back to life. Could someone elaborate on the following statement from above: "also tried it on a custom Gutsy kernel 22-11-generic from git yesterday, only changing SLUB to SLAB in the config. Suspends / Resumes fine, but its too much hazzle, as none of the restricted modules will work of course."? I've no problem building a custom kernel while this gets resolved, but I'm not clear what exactly this will affect or what else would need possible rebuilding. The only 2 restricted modules installed on my system are fglrx and HAL. Would I need to rebuild these as well if running a SLAB kernel? I am experiencing the same troubles on a Thinkpad T60p with an ATI Mobility FireGL 5200 (M56). Once I prohibit the fglrx kernel module from being loaded on X start by adding it to the DISABLED_MODULES variable in /etc/default/linux-restricted-modules-common, suspend-to-ram as well as suspend-to-disk are working. Btw the problem still persists with the most recent fglrx driver 8.40.4 that is supporting FireGL cards. I really hope that AMD will release a new driver soon that supports this cards AND fixes problems with suspend. I can confirm this issue on my Z61m. My daily work is a lot smoother with suspend working. I would like to switch to the open source driver, but that is not an option, as the X1400 in Z61m is not supported by that driver. Right? I have made the experiment of rebuilding the 2.6.22-12 kernel, the modules and restricted modules, changing from SLUB to SLAB. With this setup suspend works. Unfortunately the system is not stable after resume, but that may be an effect of something else being changed by the custom building of all those modules. Building the custom kernel was quite a lot more work than I expected, and the documentation on how to do so is somewhat sketchy - I did something along the lines of https://help.ubuntu.com/community/Suspend2Kernel. So, are we out of luck until ATI fixes fglrx? What are the chances of X1400 support in the open source driver? We are out of luck until ATI fixes fglrx for Gutsy. Maybe radeonhd makes a leap in progress for Hardy. AMD released the specifications for the cards in Z61m (I have a X1600), so 2D support should come. My Z61m with INTEL (!) GMA 950 graphics card suspends to RAM and resumes with newest kernel 2.6.22-12. Gnome-Power-Manager still reports problems after resume but the system keeps running now. It seems to be stable - I did 2 suspend to RAM and resumes and still work with it. For me it looks like if system suspends too early. If I interpret syslog right, suspend finishes until after powering system on again and then it starts resuming!? Yes, only Z61m with ATI graphics are affected by this problem. ATI + fglrx + SLAB + x.org seems to be the common element, along with some as yet unclear other factor (Core 2 Duo?). If this is widespread enough (as it's beginning to appear) it does beg the question of whether sticking with SLAB is the best choice for Gutsy, given that this breaks the "it just works" aspect of Ubuntu that is one of it's biggest strengths (and what caused me to switch from Gentoo, at least on my notebook). Non-functional power-management is a pretty serious issue for notebook users, who I'm guessing make up a decent chunk of the userbase. What alternatives are there to custom-compiling a SLUB kernel + modules? Could gutsy offer SLUB-enabled kernels and modules alongside the default SLAB-enabled ones temporarily until this is fixed upstream in fglrx? It's a bandaid and a royal PITA, but at least hardware would work as expected, and this wouldn't provide new fodder for "Linux isn't ready for the desktop" articles. Sigh. Proprietary binary-only modules really *are* evil. And to think I originally developed a preference back in the day for ATI because they supported open-source drivers and NVidia didn't. At least things are slowly coming full circle. OK, I added my problem description to another bug report which I already opened for Feisty and which fits better to my problem (#128852). At the risk of being redundant, I'll confirm that installing a custom compiled SLAB-enabled kernel and restricted modules restores suspend/resume on my machine. (Hmm. Seem to have gotten SLAB/SLUB confused in my last post. Sorry - distracted by other stuff going on around me). I can confirm this behavior on my Dell Inspiron 6400 with Radeon X1300 running fglrx. Suspend/resume should really work for notebook users. I can also confirm this behavior on a Dell Latitude D810 with a Radeon X600 running fglrx. Such a pity. I can confirm this behavior with Lenovo T60p (ATI fireGL card) fglrx driver. Suspend hangs with blinking moon icon..
configuration I can perfectly resume after suspend with iowait at only 2-3%. > sure it isn't an issue in X and/or fglrx driver? > likely that it's just fglrx causing problems. > for modesetting recently, so so I unfortunately can't help you with fglrx. > issue without the machine running X or fglrx loaded? Ningún bit ha sido maltratado durante la creación y envío de este mensaje. No bit has been injured in the creation and sending of this message. after resume from hibernation (not from suspend) always one core at 50% +. It seems the same exact issue is present in OpenSUSE 10.3. I suspend, and the system is slow as hell. The status code for kswapd is set to D< . So what I/we are experiencing is, like you said, more than likely not related to this bug. Chad, I definitely agree with you, this must be unrelated. are able to get some traces, please forward them to the Linux kernel thread. What command do I run to get traces? Did you recently switch to 64-bit (i.e. did switching from 32-bit to 64-bit solve this for you)? allows the machine to resume fine. There is something subtle going on here. Hardy on Dell Inspiron 9400 with x1400. Does it work suspending using the "pm-suspend" command? This command uses HAL to suspend; so if sleep.sh works but pm-suspend doesn't, it is most likely a bug in HAL regarding one of your hardware devices. Confirm: suspend and resume works using the sleep.sh script as well as the pm-suspend command. both successfully suspend and resume my machine with POST_VIDEO=false and SAVE_VBE_STATE=false. How do I make either of these commands run on lid close? Feel free to email me. Suspending with the sleep.sh script works but breaks the network-connections after resume (as I suppose it should...) while everything else seems to resume fine. Suspend over HAL via pm-suspend does work as well as does resuming (with working network). 1. I assume the "acpi-support" config file in /etc/default is not read/considered by pm-suspend - is that correct? 2. In what way does the gnome-power-manager define what to do at shutdown? 3. Which package/package maintainer would be the correct one to address with this problem, since the kernel itself doesn't seem to be responsible for the breakage? @Bernhard Gehl: Whenever you are in doubt about the cause of any bug, just blame dbus. g-p-m uses dbus/dcop to contact HAL. You should report it against HAL afaik. HAL uses its knowledge about the hardware to try to suspend/resume correctly. Current hardy, macbook pro 1,1 15"
So after messing around it seems it's because acpi-support isn't used at all and pm-utils is. So /etc/apci-support does not do anything!!!! Calling "pm-suspend" works since it's called with no quirks (see pm-suspend --help). But hal on my machine has 'power_management.quirk.vbe_post = true' because of 20-video-quirk-pm-apple.fdi changing it to false fixes resume/supend from System->Quit "logout window"
You can check with lshal |grep quirk and see what quirks is set and change the corresponding fdi files for you machine. * Hal quirks is wrong for fglrx platforms with kernel 2.6.24. * Hal is supposed to use acpi-support on ubuntu but patch isn't applied ? Suspend/resume also works for me now, on Hardy, with default Ubuntu fglrx module (pm-suspend only, not KDE suspend, but that's Bug #202814). Since so many people have this working on Hardy, it seems as though the SLAB/SLUB issue is fixed. Should it be marked as "Fix Released"? I suffer from this issue as well, please report it separetly. I noticed that with todays update suspend and resume is working with fglrx driver ati 8.3 from repro. Before i had a blackscreen after resume. It's working with and without compiz fusion. It could be the new acpi update that makes suspend/resume running. Thanks for fixing that issue. Actually it was a bug in pm-utils/hal - well not even a real bug, but rather a patch doing the right thing in many cases but the wrong thing for fglrx-driven machines. The recent updates to hal, libhal* and pm-utils fixed it. Thanks, folks! Is this with Gutsy Gibbon or Hardy Heron? Uh-oh. Like SixedUp I have: IBM Thinkpad T60p, with an ATI Mobility FireGL V5200, and I was really excited about the possibility of working suspend/resume in Hardy. I just did a fresh install of hardy and made the POST_VIDEO and SAVE_VBE_STATE edits in /etc/default/acpi-support. Suspend works, but I get no display upon resume. Otherwise, the machine *appears* to be working. 2. I installed hardy on an external USB drive (actually an ipod 60G) a few days ago, and suspend/resume worked ... except that the drive disappeared upon resume, so you couldn't do anything. However, the display was visible. Is it even conceivable that the use of LVM or USB affects whether fglrx resumes properly? 3. Incidentally, suspend/resume *does* finally work on my old Dell inspiron 9300 using fglrx under Hardy. Furthermore, disabling fglrx in the "Hardware Drivers" application (and rebooting, of course) did not make suspend work again. Something happened between the April 15 daily build and tonight's state of the hardy repositories. The one other possibility I can think of is that it's something in my xorg.conf that is unrelated to fglrx. My problems may not have anything to do with l-r-m; I'm in the process of determining whether it's related to https://bugs.launchpad.net/ubuntu/+bug/218760. Will report back. then suspend works ONCE, but fails thereafter. Next I'm going to roll back to fglrx 8-2 and then 8-1 if necessary to see what happens. Fails also with fglrx 8-2, which incidentally is tricky to build for Hardy as things stand now (see below). Everything (basically) seems to work except that the screen never comes back. Occasionally there will be a one-line message on the console, sometimes about a soft lockup (!) which you can see in the attached dmesg. I can ssh into the machine, but the only way to regain control is to kill Xorg, unload fglrx, and reload it, then start up GDM :(. Everything works so closely to the way things were working with Hardy's own fglrx 8-3 that I think I'd find the same thing when ssh'ing in after a resume with that driver. Next I'll try the 8-1 driver that was part of the distro on the 4/15 daily build CD. The same build procedure applies to the 8-1 driver, but I was unable to get it to work. I'll probably try that again in a few minutes, along with the 8-4 driver. Is there somebody out there with suspend.d fu who can easily write the scripts to do that while we wait for a real fix? Whatever problems remain (for me) are all described more precisely by https://bugs.launchpad.net/ubuntu/+bug/197209 and https://bugs.launchpad.net/ubuntu/+bug/218760, so I'm marking it fixed in the upcoming Hardy release. I will attach workarounds to #197209 tomorrow when my head is clear. This problem is NOT fixed using the 8.4 Catalyst drivers with the Hardy release candidate. The first time after resuming from suspend using the 8.4 drivers, 100% of the CPU was being used (according to htop), and running '/etc/init.d/gdm stop' brought usage back down immediately. I believe I am having the issue described by this bug as reverting to the Feisty kernel with Gutsy did resolve this issue entirely. Please please please vote on this bug: http://ati.cchtml.com/show_bug.cgi?id=739. I cannot believe ATI is ignoring this bug. I am going to try, once again, to compile a kernel--for Hardy this time. If all goes well, I will try to make it downloadable for everyone. suspend/resume with fglrx 8.4 on hardy works for me (t60 with 1400) as long as some usb devices are not attached, notably my scanner. i got fglrx 8.4 (and other updates) from this backport. install the backport modules. it's mentioned on comments on another bug regardling the switch from the ipw3945 wifi module to the iwl3945 in case you're wondering. to your sources.list, run apt-get update, and then install the packages? Can you be more specific on the packages you installed? Did you install xorg-driver-fglrx-tdfx? linux-restricted-modules? Firmware? I've noticed since Hardy beta lots of people have been posting on here about hardy suspend/resume. I read most of the posts, but was wondering if the issue was ever really resolved in gutsy? I switched back to Gutsy for reasons other than this issue. I had other Ati problems dealing with an unstable system and sound. However, when using Hardy I had suspend and hibernate working with the latest Ati drivers, but they were slower than molasses. Plus the sound died on the system after each task executed. I have Gutsy with kernel 2.6.22-14-generic and just the restricted drivers enabled (Ati radeon Xpress 200m). To be honest I'm a little scared to mess around with the drivers since everything else (like compiz and other 3D rendering) works so BRILLIANT! Obviously, neither hibernate nor suspend work for me and give all the exact symptoms that have been reported above over and over again. So maybe somebody found a loop hole and I missed it on here? Probably not, but hey with such a stable system I'm not complaining too much. I still think Gutsy is better than Hardy. Should be "Won't fix" (2.6.22 in Ubuntu 7.10 not supported anymore) but I don't seem to have that option. Displaying first 40 and last 40 comments. View all 314 comments or add a comment.